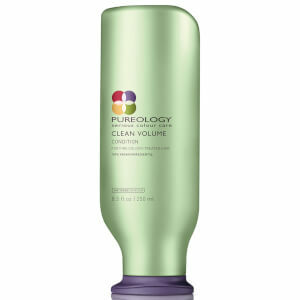 Pureology's Clean Volume Coffret combines three hair care essentials for achieving full-bodied, volumised locks. The shampoo, conditioner and blow dry spray work in synergy to boost the appearance of fine, colour-treated hair while protecting colour vibrancy. Suitable for fine, flat, colour-treated hair. Free from sulphates and surfactants. 100% vegan. 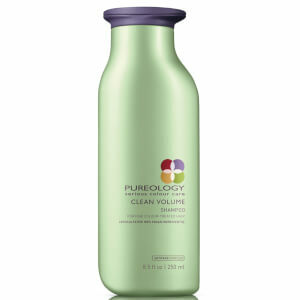 A leave-in blow dry spray that adds weightless volume while protecting against heat damage. Delivering lightweight, airy volume, the mist promotes fullness at the roots to lend limp hair a lifted effect that lasts. It contains moisture-retaining Aloe Water, and fortifying Soy Protein to protect and strengthen every strand. Lifeless hair is transformed; witness renewed body and bounce. Free from parabens. Shampoo: Aqua / Water / Eau, Decyl Glucoside, Cocamidopropyl Betaine, Sodium Cocoyl Isethionate, Cocamide Mipa, Sodium Chloride, Peg-55 Propylene Glycol Oleate, Propylene Glycol, Glycerin, Parfum / Fragrance, Sodium Benzoate, Brassicamidopropyl Dimethylamine, Hydrogenated Coconut Acid, Salicylic Acid, Sodium Isethionate, Tocopheryl Acetate, Hydrolyzed Soy Protein, Aloe Barbadensis Leaf Juice, Butylene Glycol, Benzyl Alcohol, Benzyl Salicylate, Linalool, Helianthus Annuus Seed Extract / Sunflower Seed Extract, Coumarin, Ethylhexyl Methoxycinnamate, Citronellol, Citric Acid, Potassium Sorbate, Bht, Sodium Hydroxide (Fil: D198913/1). Conditioner: Aqua / Water / Eau, Cetearyl Alcohol, Brassicamidopropyl Dimethylamine, Parfum / Fragrance, Sclerotium Gum, Tartaric Acid, Caprylyl Glycol, Salicylic Acid, Glyceryl Stearate, Kaolin, Tocopheryl Acetate, Hydrolyzed Soy Protein, Ethylhexyl Methoxycinnamate, Aloe Barbadensis Leaf Juice, Butylene Glycol, Benzyl Alcohol, Benzyl Salicylate, Linalool, Helianthus Annuus Seed Extract / Sunflower Seed Extract, Coumarin, Citronellol, Citric Acid, BHT, Potassium Sorbate, Sodium Benzoate (Fil: D198910/1). 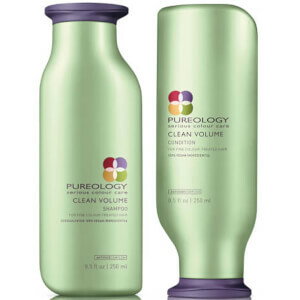 Blow Dry Spray: Aqua/Water/Eau, Butylene Glycol, Amp-Acrylates/Allyl Methacrylate Copolymer, Peg-14 Dimethicone, Phenoxyethanol, Peg-40 Hydrogenated Castor Oil, Sodium Polystyrene Sulfonate, Parfum/Fragrance, Menthol, Ethylhexylglycerin, Panthenol, Helianthus Annuus Seed Extract Sunflower Seed Extract, Hydrolyzed Vegetable Protein Pg-Propyl Silanetriol, Tocopheryl Acetate, Ascorbyl Glucoside, Xylose, Benzophenone-4, Helianthus Annuus Seed Oil/Sunflower Seed Oil, Limonene, Linalool, BenzylSalicylate, Hydroxypropyltrimonium Hydrolyzed Wheat Protein, Coumarin, Benzyl Alcohol, Camellia Sinensis Leaf Extract, Glycerin, Melanin, Eucalyptus Globulus Extract /Eucalyptus Globulus Leaf Extract (F.I.L. D176737/1).